1. implementation class of Queue. 2. The elements of the provided are ordered according to their natural ordering or by a comparator provided at Queue construction time. 3. Null elements are not allowed. 5. It is based upon priority heap. 1. 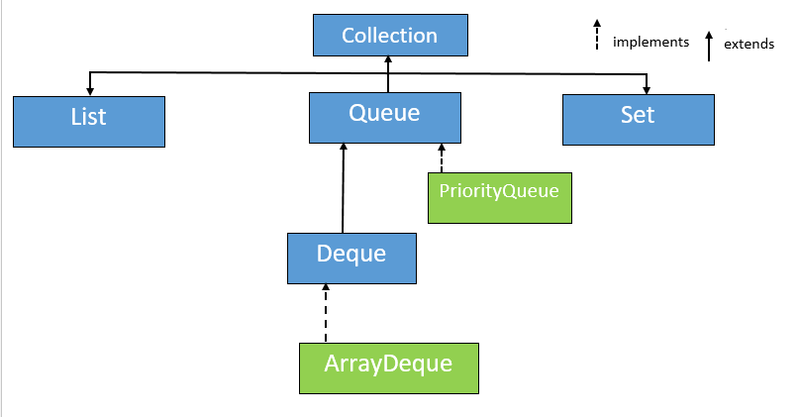 PriorityQueue(): The first constructor is used to create an empty Queue with the initial capacity 11. 2. PriorityQueue(int initialCapacity): This constructor creates a Queue with the specified initial capacity. 3. PriorityQueue(int initialCapacity, Comparator comparator): This constructor creates a Queue with the specified initial capacity and comparator. 4. PriorityQueue(Collection c): This constructor creates a PriorityQueue containing the element in the specified collection. 5. PriorityQueue(PriorityQueue q): This constructor creates a PriorityQueue containing the element in the specified PriorityQueue. 6. PriorityQueue(SortedSet ss): This constructor creates a PriorityQueue containing the element in the specified SortedSet. 1. boolean add(E e): This method is used to add the element in the PriorityQueue. It returns false if the element is not successfully inserted. 2. boolean offer(E e): This method is the same as add() method only difference is it throws NoSuchElementException if the Queue is empty. 3. void clear(): This method is used to remove all the elements from the PriorityQueue. 4. int size(): This method returns the size of the Queue. 5. boolean remove(E e): This method is used to remove the specified element from the Queue. 6. E peek(): This method returns the element at the head of the Queue but not removed, it returns null if the Queue is empty. 7. E poll(): This method returns and remove the element at the head of the Queue and it returns null if the Queue is empty. How to get an element from ArrayList? How to implement a LinkedList in Java? What is LinkedHashSet in Java?